As previously announced, the cast of SBS’s You’re Beautiful held another mini-concert on November 23, where footage was shot for the drama’s final episode, which airs this Thursday. 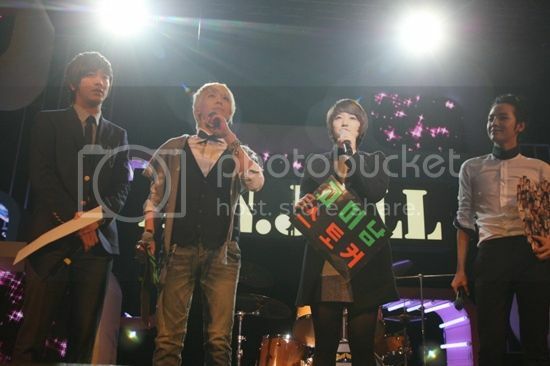 The mini-concert was held at Seoul’s Melon AX Hall at 6pm and featured all four of its main cast members — Jang Geun-seok, Park Shin-hye, Lee Hong-ki, Jung Yong-hwa — who make up the fictional idol band A.N.JELL in the show. Even with only a few days’ notice, a crowd of more than 2,500 fans showed up. Meanwhile, the soundtrack continues to be a hit. Last month, it had sold more than 20,000 albums within its first week, which is an unusually high number for a soundtrack. Well, it has continued to perform strongly and has now sold more than 30,000 units total. i really like this drama... sad that it's coming to an end. omg i really really hope i don't see any spoilers as well. I didn't really expect anything from this drama. didn't even hear about it before the airing but i gave it a shot. now, it's my absolute favorite. it's very light and refreshing. i don't really know but all i know is that it makes me feel good when i watch it. I'm really sad now that it's ending, wishing it was longer. I'm definitely buying the DVD set when it comes out! Argggggghhhhhhhhhhh....... Wish i was there!!!!!!!!!!!!!!! I'm feeling so torn about this week's episodes!!!! Wanna watch them but dont wanna say goodbye to this fantastic drama!! am i first? can't wait for last few eps! Ef, ef, ef -- I have already started crying, and it's not even Thursday night, for when I already have made plans to be thoroughly depressed. Thank you so much, JB, for posting this story. I was hoping that you were not on a boycott of all YAB-related news, so a super-loud thanks to you for braving the spoiler waters to bring us this. This really was one gem of a drama. Ensemble-cast dramas can be tricky, and this one was pitch-perfect (lol, pun). I will miss it tons. P.S. If anyone in this thread posts spoilers -- even obliquely referenced spoilers -- I swear I will hunt you and, OMG, I will so hunt you down. You can guess the rest :-) . I'm going to miss this drama. JB, do you have in mind, what drama(s) you might pick up for recaps after YB finishes? Don't think there's any spoilers for the concert parts. BUT DON"T watch any of 'The Making Of' videos. I think it might contain some spoilers. must've been a blast to be there. new mantra to cope with this sinking feeling in my stomache whenever i hv YB thoughts lately..
hahaha i was about to get REALLY excited when you wrote write underneath "note: don't get excited" i'm really sad that YAB is almost over. if it weren't for IRIS, it would have been so much more of a hit. it's way better than BOF! so if it weren't for IRIS, we would have an episode extension. i'm so sad. and i feel deprived. SEASON 2 PLEASE!!!! Thank you JB for another great dose of YAB coverage! 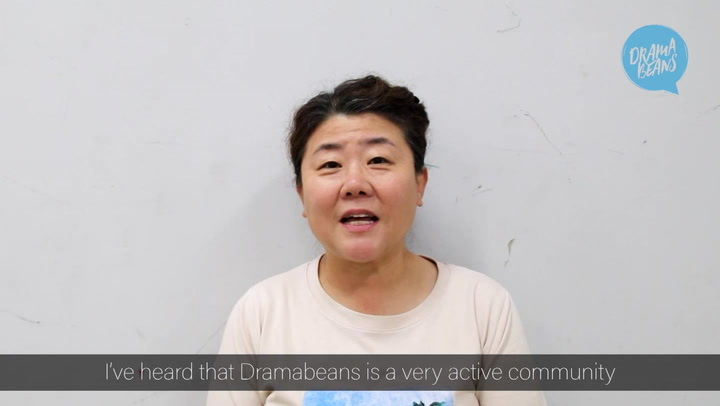 I'm really thankful for this drama, earlier on Soompi I read the message the Hong sisters left on the SBS webpage, and their words of love were just so touching...they really care about us, fans/viewers, and everyone and everything involved with YAB! They wanted to bring out the young at hearts in everyone, and they certainly did! Old or young, I think all of us felt like we were experiencing first love or something, at least, I did, it was like falling in love again...They are amazing, thank you Hong sisters for making me and many others feel young again! I am glad ANJell included their fans for the finale, as what's an idol without fans? I'm also impressed that they dressed up for the event, it really makes it special, a special occasion indeed. It's almost farewell...but not yet! Again thank you JB for sharing your lovely site with us! awww, poor girl... initially i was planning to be depressed these 2 days (too) and maybe some after but life really has to go on..
"DVD will be out soon. DVD will be out soon"
I love the last photo. OMG! Wish i was there for the concert. It looks so much fun. This sounds fun!! I cannot wait until the last two episodes to air. ...another wholesome, endearing, funny, exciting, weekly-episodes-worth-waiting-for-drama...is about to come to an end this week....such are the peaks & downsides of being a KDA!!! I should have been on that concert!!!!!!! waaaaahhhh!!! I don't know how many times I can say it in my lifetime that "I should have been in Seoul for this..." or "How I wish I live in Korea right now"..
Congratulations to You're Beautiful!!!! 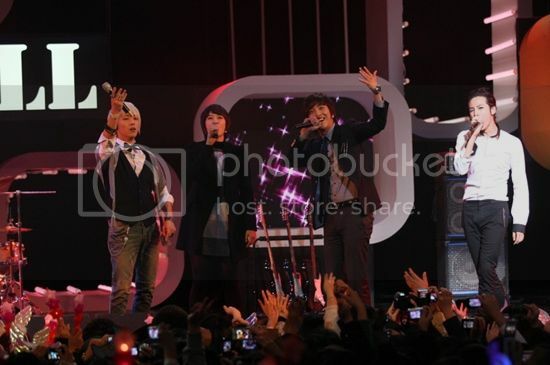 A.N.JELL please make a comeback soon! i'm feeling intense nostalgia for the drama before it's even ending..
i wish we could start an online petition for season 2. or something similarly far-fetched. sigh. i'm so with you on every aspect of your post! from the sadness at the drama being over to the homicidal thoughts about people who post spoilers. seriously. i already got a really big spoiler because it's freaking EVERYWHERE and i kinda kicked a baby off a cliff after that happened. grrrr. Yay! Thank goodness you wrote about this. I wanted some news about the mini concert but I know soompi is a spoiler minefield at the moment! Gosh, I wanted to go to the mini concert! Damn work! I'm hoping I can stay spoiler free till tomorrow, anyone else having a hard time avoiding them?? "Note: Don’t get too carried away — this does NOT mean there will be a Season 2!)" for this one, although it doesn't mean a 2nd season will be out, but at least SBS is considering about having a season 2! We still have hope! haha! aja-aja fighting! Pray that Season 2 are still using the same cast and same writers! Otherwise its not fun! Dangling the Season 2 carrot in front of us. Thank you JB for such a quick update on the concert! It's really nice of them to organize another concert to film it as part of the drama and thank the fans as well. I wish I was there to see the fanstatic cast. Can't for for Wednesday & Thursday. Sad I am as the drama is ending but this drama is going to live in my heart for a very very long time. /chant with everyone -> DVD soon DVD soon! Had been checking your site since last night hoping for an update on the concert. It's good that fans really went out there and gave their support. It somewhat makes it bearable for us non-Korean fans that we were unable to attend. It's really interesting how we YAB addicts always want to show our support and make the cast feel that they are soo loved and their efforts very much appreciated despite the low ratings. It used to make me feel put down whenever people mention the show's low ratings. But now i learned to just console myself by thinking: well, it's their lost, our gain" right? All i know is that my 2009 has definitely become more exciting because of YAB and AnJell.. and HTY in particular. Keke.. I'm already very depressed about the series ending this week. Yes, I expect tears (mine, as well those already in mid-shed by GMNy and HTK), but I also expect just a huge gaping HOLE in my life once it's over. It's the downside to watching a series live, but I wouldn't trade in the experience of watching it week by week with all of you... the analysis and commentary and sheer joy of communal watching is and has been wonderful. But oh, huge gaping hole in my entertainment life is looming. Sigh. Sad that the show is ending. Happy because the show inspired me and even for few days and few weeks the show really made me smile. I say that this is unforgettable. Thanks JB for the recaps, because of your site I came to love Koreans. hehehehe. It's great that so many fans supported them, as we overseas fans could not do so, though our hearts are already there. I watched both You're so beautiful and Iris (of course I only watch Iris after I have watched YAB), but frankly, I found that YAB is more interesting. Although we are sad that the drama comes to an end, I think it's only a start. From now on, I will pay more attention to the lovely characters (all three male stars are so cute and lovely) in their future development. For those who are wondering about MN's dress. She is wearing a TK's jacket. He must've taken it off during a scene and put it on her. I am very sad it is almost over... I'd like to book a room in YAB rehab. I'm sad that the show is ending this week. 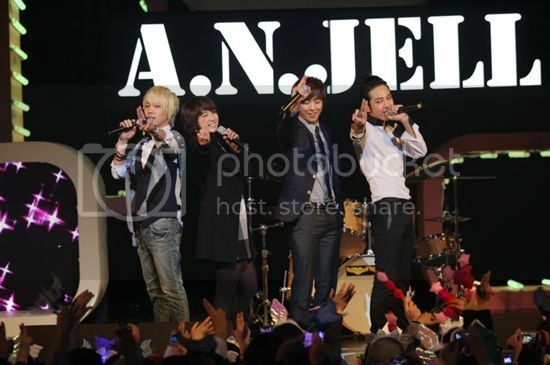 What will I do without Taekyung, Mi-nyeo, Jeremy, and Shinwoo and the beautiful, heartfelt music of A.N.Jell? I love the Hong sister dramas and it will probably be another 1-1.5 years before the next one will come out! "Because we were scheduled against such a huge drama [IRIS], there was a lot of talk about us being doomed to die in the timeslot, but the fact that we stayed alive is the power of you all.”" ---> this almost brought tears to my eyes. it's so touching. I'm pretty if I hear JGS say this with his beautiful voice, I would really cry. 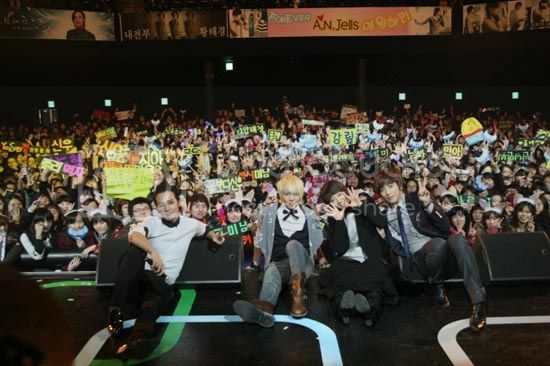 And i love the pic with them posing alongside their 2,500 fans that you posted. wow!!! THIS REALLY MADE ME CRY!!! ppl.. i know it's hard but think all the wonderful things once the drama is wrapped up..
our young cast will be able to rest, sleep more (that's important) they've worked so hard. then they'll be able to come back to us with another project - tho individually..
those who order the cute pig rabbit will get them.. lucky you! what else? can't really think much now..
sure, our heart is heavy to say farewell (still another 2 eps to go) but all this has been a fun ride, we already make lots of fond memories of them .. Thank you JB for your articles and anything we can get our hands on this wonderful drama. We have turned into groupies lol over this show. Loving it!!!!!!!! I am joining you on that bus. that is one of the cutest ideas i have seen in the drama. Next time i am depressed i am going to try it. Maybe next week when i don't have YB to watch, but you know what SMILE is a good show i am joining them.